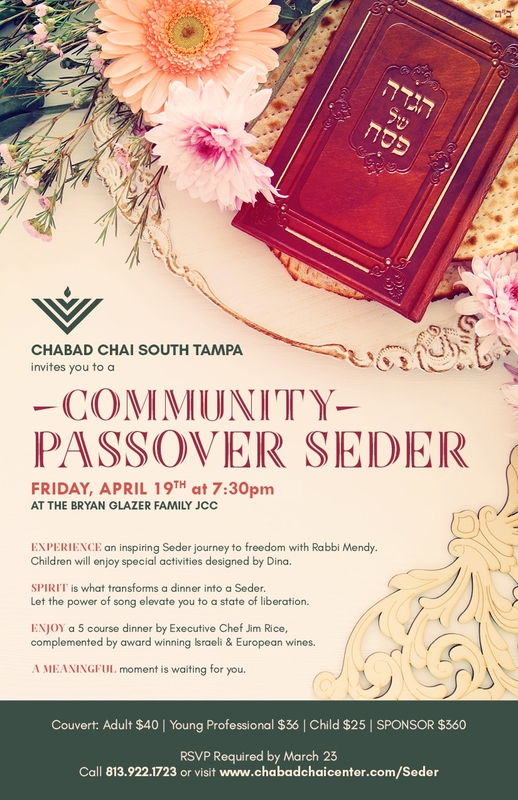 Chabad Chai - South Tampa invites you to a Community Passover Seder to be held on Friday, April 19th 7:30pm At the Bryan Glazer Family JCC. EXPERIENCE an inspiring Seder journey to freedom with Rabbi Mendy, while the children enjoy special activities designed by Dina. SPIRIT is what transforms a dinner into a Seder. Let the power of song elevate you to a state of liberation. ENJOY a 5 course dinner by Executive Chef Jim Rice, complemented by award winning Israeli & European wines. A MEANINGFUL moment is waiting for you.